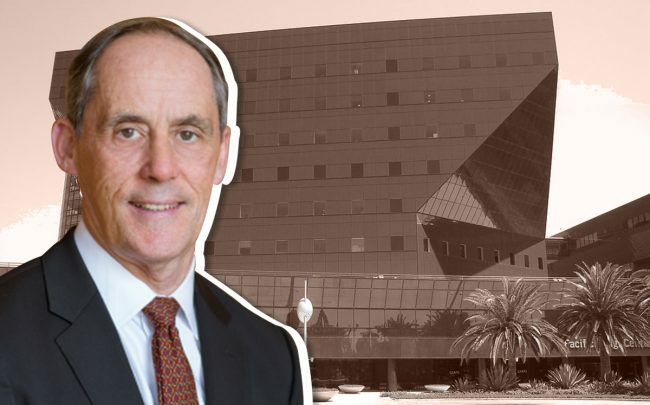 Cedars-Sinai health system is boosting its space at the Pacific Design Center, where it has been a tenant for the last three years. The nonprofit’s newest lease for 30,000 square feet expands its footprint at the West Hollywood complex to more than 100,000 square feet, according to the Los Angeles Business Journal. Cedars-Sinai first moved into the complex in 2016. Cohen Brothers Realty developed the 1.6-million-square-foot Pacific Design Center in 1999. Marc Horowitz, the company’s national director of leasing, advised on the latest deal. CBRE’s Todd Doney represented Cedars-Sinai. At 8687 Melrose Avenue, the Pacific Design Center is about a half-mile from the Cedars-Sinai hospital main campus. The hospital system leases offices and medical facilities around the city. Each of the complex’s three buildings is clad in monochrome glass — one red, one blue, one green. In 2016, Cedars-Sinai leased 46,500 square feet, the entire fifth floor of the Green Building for administrative offices. It also took another 30,000 square feet at the Blue Building. At the time, a source said the lease was worth $54.7 million over a 15-year term. The Pacific Design Center has been popular with tech and media companies. WeWork has leased 70,000 square feet since 2017. Last year, film production company A24 and artificial intelligence company Poletus inked leases there.